Did you know that braces have been around for decades? Even people in ancient times wanted to improve the function and look of their teeth. Oh boy, have braces come a long way from when they were first invented. From the bulky wrap-around brace of the 50’s to the slim, invisible design of the 2000’s. Happy Smiles in Kansas City is here to tell you why wearing braces today isn’t as stressful or awkward as it used to be. Tooth straightening devices were recorded to be created back in the Egyptian times. However, the term “braces,” wasn’t officially coined until the 1900’s. Braces from the 1900’s are a lot different than the braces of today. Bands of various materials would be individually wrapped around each tooth. Those band would then connect to a wire that would be adjusted to apply pressure to the teeth. They did this in hopes of slowly moving the teeth into the proper placement. Back then there were no set standards for materials used in braces. Some dentists used wood, copper, zinc or even ivory. The materials used all depended on the patient’s budget, the dentist’s preference and what materials were readily available at the time. Fun Fact: Gold was the preferred brace material by dentists all over the world. Gold is flexible when heated and could be shaped and molded to wrap around teeth easily. Unfortunately, gold braces required more adjustments due to that fact that it would start to grow soft from body heat. Orthodontic techniques didn’t make a significant change until the 1970’s when they made breakthrough after breakthrough. 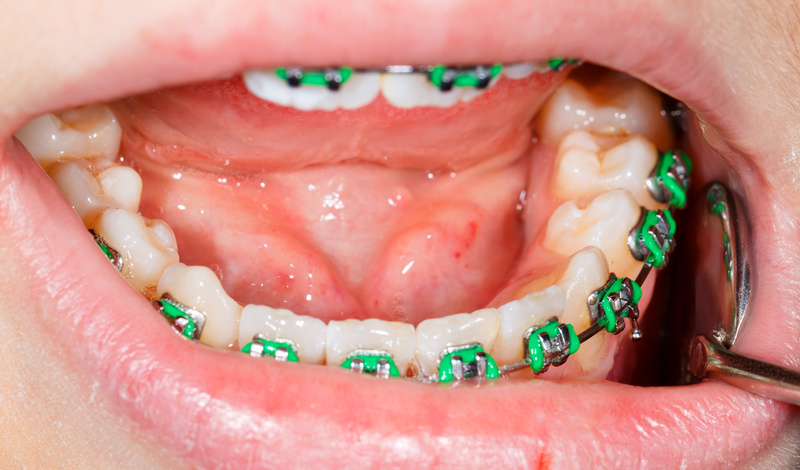 The biggest breakthrough was the use of dental adhesive to hold dental brackets in place. Dental brackets would be placed on top of dental adhesive that was ultimately stuck to the teeth. This breakthrough technique removed the necessity of individually wrapping teeth to keep the brackets in place. The use of stainless steel was adopted into most dental practices. Tie wires and elastic ligatures were also used to keep braces in line. The first attempt at ‘invisible’ braces was made. The idea of invisible braces was a great interested and study between the 1970’s and early 1990’s. The technique wasn’t successfully created until 1997. So what are invisible braces? Invisible braces are essential clear braces that are inserted behind the teeth, making them ‘invisible’ when you smile. Traditional metal braces have become smaller and more efficient when it comes to straightening teeth. In fact, for most individuals the first day of wearing braces is the most uncomfortable and is far less painful then the braces worn in the 1970’s. Not only can braces be invisible they can change color as well. The rubber bands used with braces now come in a variety of fun colors that can be changed at each orthodontic appointment. Some brace wearers have been known to change the color of their braces to match the season, holiday or their wardrobe. Flossing your teeth while wearing braces is easier. You no longer have to use a threader! You can know use a special flosser that gets under the wire and between your teeth with ease. One of the only aspects of wearing braces that has not changed over the past few years is the post-brace retainer. Fun Fact: Most retainers are thrown awake by mistake. This happens when they are removed so you can eat. Did you know that Happy Smiles in Kansas City offers orthodontics? Get all of your children’s dental needs taken care of in one place! Contact Happy Smiles if you are in need of braces in Kansas City! Our team understands how uncomfortable it can be to need braces! Don’t worry we can make the process as painless and stress-free as possible!